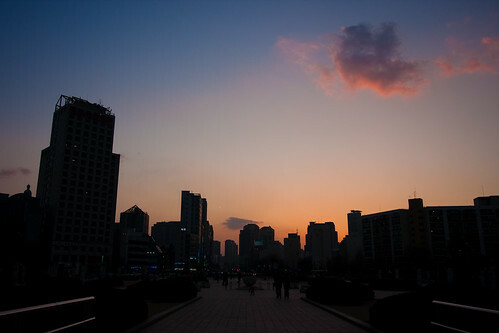 The sun sets over Seoul, as seen from Olympic Park. As the end of May approaches, I’m rounding the three-quarter mark of my teaching contract. The end of this go-around is visible on the horizon, and it’s the popular water-cooler — actually more likely patio table — topic of the moment. Are you staying? Are you going? What’s next? It’s decision time around the city, and Korea continues to impress me with its professionalism. My co-teacher breached the topic of renewing with this gem: “Are you satisfied with your job?” Clearly that’s the only criterion we use to decide whether we should dedicate another year of our lives to this country. In addition, this conversation happened yesterday, and the deadline for my decision is tomorrow. If my math is correct, that gives me two days to choose. Awesome. Two days for a life-changing decision. That pretty much summarizes life as an English teacher in Korea: as adventurous and challenging as it may be, it all comes and goes very quickly. Nine months ago, I arrived as a wide-eyed American, but it feels like the pages of the calendar have just flown off the wall. The evanescence of this experience, however, goes beyond the time that passes. This experience is as much about the people as it is the place. Ever since orientation, when I was quarantined for a week with 200 other foreigners, I’ve basically survived with this group of friends. Now with the questions, we all realize the adventure will soon drastically change for everyone. A large portion of this group is headed in different directions, and it’s over, just like that. We’ve all been through this at least twice before: high school and college. I had essentially the same friends from second grade through graduation — 11 years — and then I had to move on and start over. The cycle repeated itself in college but instead in a five-year period. Now I’m in Korea, where the lifespan of an English teacher — and its consequent friendships — is all too often only one year. Tomorrow I decide whether this one year in Korea is enough for me. I think the easy decision is to avoid the unknown and re-sign, but the thought of giving one more year to this venture isn’t one that inspires joy in me — especially without a handful of my newest and closest friends. They’re leaving as quickly as they appeared, and I could very well do the same thing.